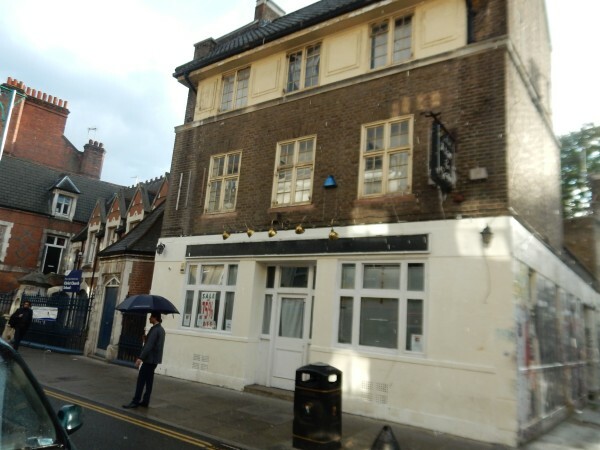 The Seven Stars Pub in Brick Lane was for as long as I’ve known it, a sad and lonely place. This was a time before the hipsters colonised Brick Lane. The Seven Stars was always empty, just the odd stall holder, pensioner and ‘Wolf Man’. ‘Wolf Man’ was an old bodyguard of Oswald Mosley, of the British Union of Fascists fame. ‘Wolf Man’ was tolerated, he never spoke, just sat on his own drinking brown and mild and every now and then he would give out a wolf like wail. Today the Seven Stars lies empty a monument to an old decrepit corner of east London. But something beautiful has happened, like a phoenix rising, an urban galley of street art has emerged. You enter this oasis through what was the pubs side yard entrance. 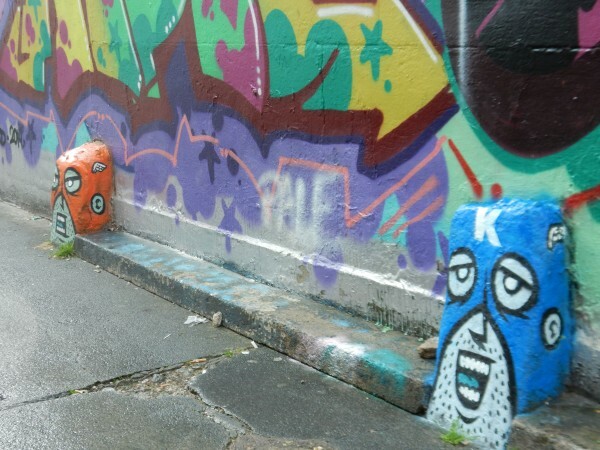 Along one side, two stone curb stones have been painted by Captain Kris – whose comic style I adore. 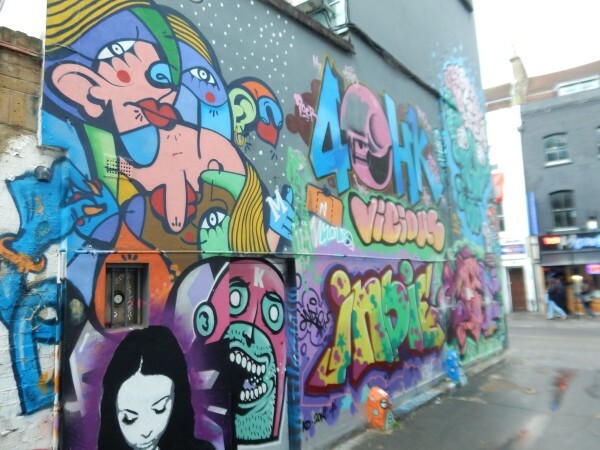 Both walls are covered in an array of street art and graffiti. 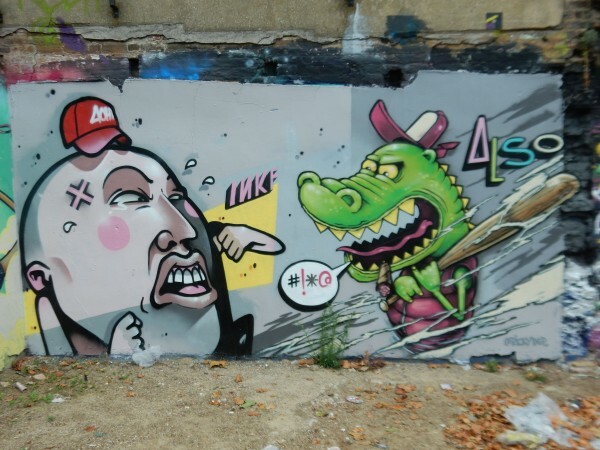 On the right hand side wall is a wonderful collaboration – I can’t name all the artists but it includes Hunto, whose work is clearly inspired by cubism and Picasso, Captain Kris, Vicious and many others. On the other wall is a Portuguese artist Furia ACK. It’s a black and white painting of Chilean poet, singer and political activist Victor Jara. Jara was assassinated by the Chilean Army under the direction of the US backed dictator Augusto Pinochet. 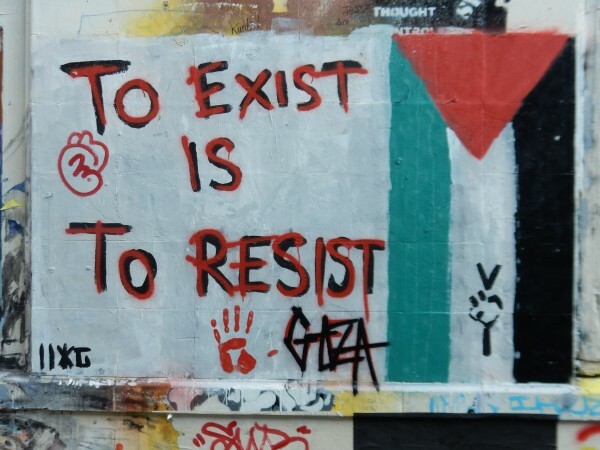 Next to Furia’s piece is a simple but effective piece of graffiti dedicated to the Palestinian struggle (artist unknown) [UPDATE 31.08.14 It’s by IIXG]. 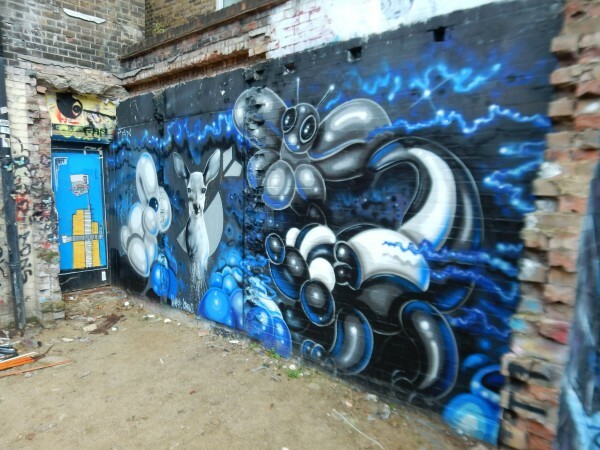 Once your through the entrance yard to enter a square full of amazing works of art – ALO, Nathan Bolton, Captain Kris, Jimmy C, Selor, Ink Fetish, Horror Crew and a whole host more. Below are just a couple of the works that can be found in the yard. If you are around Brick Lane please try and visit this Aladdin’s cave. Thanks. Fascinating. You are missing an apostrophe s after Mosley. Was Wolf Man a bodyguard from his Shoreditch election days or even earlier? Thanks Streetstuff – I’ve made a minor edit to get round the apostrophe problem. The unknown artist’s tag is IIXG, thanks for spreading the word, appreciated. Thanks IIXG, and you’re welcome. I’ve made a quick update to the post. Sorry only just spotted this question Wolf Man was Mosley’s bodyguard in the 1950s and again in the late 1960s.